Thank you for the great service you gave us when we hired the bikes. The staff were amazing when we were suddenly faced with extra children that had told us they could ride but couldn't! Please pass on our gratitude to all the staff and to the one that cycled to us very quickly with a replacement bike half way through our ride when the chain snapped. Just wanted to say thank you for the great customer service I received today. I am disabled and needed some advice on which cycle would be best for me. Your staff were friendly and helpful, and I left knowing exactly which bike I need to hire from you in the future. Particularly impressed with the red-headed staff member, I'm sorry I didn't think to ask his name. My name is Ben and I am writing to thank you for letting us hire your brilliant bikes, I thought they were really good and I would definitely recommend you to other people. The trail was very scenic too and the ride was not too bumpy but my favourite part was when we went over the bridge and you could look down and see the beautiful water below. I was very impressed by the speed you managed to get the bikes out and get us going. I am also going to thank you for telling us were to get our bikes replaced if they broke and thank you again for letting us hire your bikes. 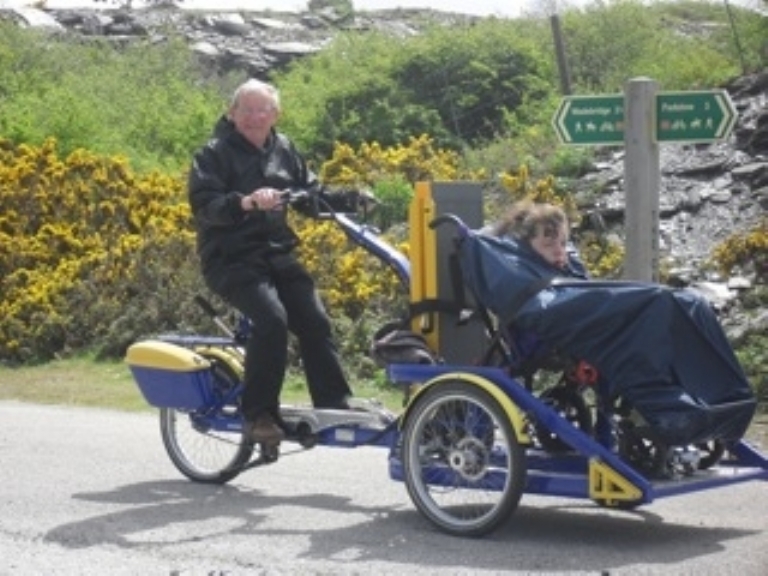 My name is Rufus Robson, I am writing to express my gratitude for letting us hire forty bikes for the Camel Trail. The bikes were amazing, the gears ran fine and it was all flat for the cycle, which was really nice, especially because some of us had hardly cycled before. The views are excellent from the Camel Trail. I Look forward to trying out the Camel Trail again. Just a short note to say thanks from all the members of Bude Ladies Circle to you for opening and supplying bikes for us on Tuesday 18th June. We had a wonderful evening and couldn’t have had better weather for cycling if we tried, also with the football on it was so quiet and we had the place to ourselves. Hope you enjoyed the match it was a good one - wasn’t it! Anyway thanks again and we send our best wishes for a successful season. Thank you for lending us some bikes for the Camel Trail. It was really long but I didn’t get as tired as I thought I would because I was having so much fun. Some people feel off and they walked for a while but they got over it and carried on riding again. I had a really nice time, thanks again. Thank you for lending us your bikes and helmets to us. We enjoyed riding along the Camel Trail on the bikes. The views were spectacular and everyone took pictures, someone fell off their and fell in the stinging nettles. We all cycled to Padstow and had free time to buy something. The weather improved as the day went on. Thank you very much for telephoning to let me know that we had left our camera in one of the bicycles we hired from you during the summer. It was very kind of you to even consider telephoning us! Fortunately a friend of mine living here is visiting England at the end of October and will be happy to bring our camera back with her. My family and I had a wonderful time on the Camel Trail – what a brilliant use of a disused railway line! We shall now look forward to seeing some of the photographs of that memorable day. Before Health and Safety - although we didn't encourage this then either! A very old letter and picture from a happy customer. Not something you could get away with these days but just goes to show families have been enjoying their holidays with us for a long long time! You may not remember us hiring bikes from you in the summer but I thought you’d like a copy of the enclose photograph! 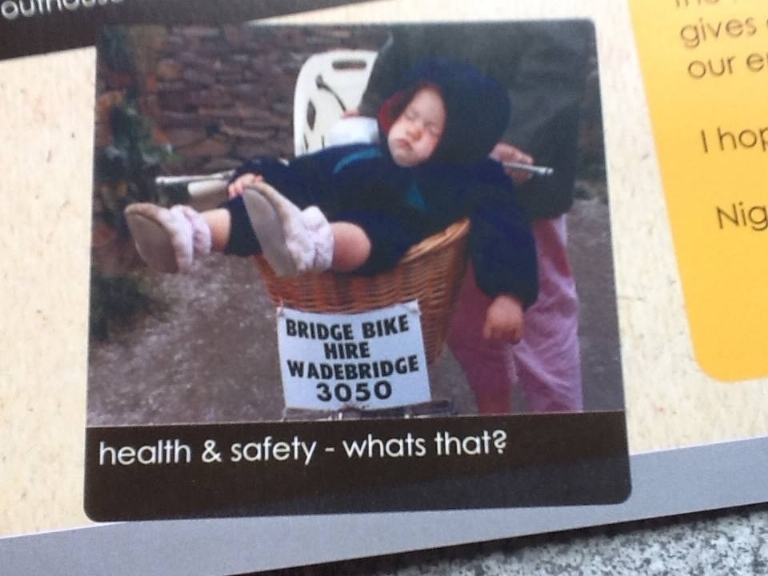 It’s a very good advert for you comfort of your bicycle baskets but perhaps doesn’t advertise the rear child seats so well! She slept for a good hour like that and nearly brought pedestrians in Padstow to a standstill! We thoroughly enjoyed our day on your bikes and will be back for more next year. Just to say that that the ride went well and thank you for making it possible. Made Padstow despite a northerly head wind of about 30 mph. Photo attached of myself and Emma underway at the slate quarry. The return journey was somewhat easier. I found the bike easy to steer and deal with, good brakes and gearing helped. Although It is hard work, especially in the windy conditions, so you need to be prepared to get stuck in. We have never known it that windy but the weather all week was wet, windy and cold. Our day on the bikes was at least dry. We parked it at Padstow Cycle Hire just for ease and it was really useful to then push Emma around in the buggy in the town. It was always difficult with the Duet once we were in town. Next time I don’t think I would take the ramp. We easily lifted Emma off and on. It just adds weight and more wind resistance. Hope you get some more people who are up for it. I’m certainly up for it again. We are definitely coming down next May but hopeful we might get down in September. Ps By all means use the information as you like. The more people who can be encouraged to use it the more likely it is to be available for our use. Please tell people it is also a fantastic day out and I would encourage people to give it a go. If you are up for the challenge a half physically fit go for it. I know Emma enjoys the day and it enables all our holiday group to do the cycling day rather than some one staying at the house with Emma.